Let’s hear a bit about your musical background. How did you get started in music? My dad was a drummer, and I had always wanted to play, but my parents wouldn’t let me start music until school band in 4th grade. I started out on saxophone. Sophomore year in high school I switched to playing drums in school band, but I had been playing drums since 7th grade. Is your father a professional musician? He’s not a professional, he works at the post office, but he plays every day and has always been playing in bands. In the 60s, he was making a living playing music in hippie rock bands and country bands. As soon as he had a family, he got a “real job”. He moved to the Bay Area from St. Louis in his 20s to play music. What sort of musical influence did your father have on you? My dad was all about discipline and practicing, so he really drilled that into my head ever since I was a little kid. I’ve always been about having a daily routine, and that’s from him. My dad also bought me this Glen Miller record that I loved – it was the first CD that I memorized! I would listen to it over and over. From then on, I was just really into jazz. As soon as I learned how to read music, I started writing it. The first stuff that I was writing, I was ripping off from Glen Miller. What sort of musical path did you take as you went through school? I was playing in Jazz Band & Wind Ensemble, Alto, Tenor & Baritone Saxophone. I studied sax with Dan Zinn, who was really intense and also instilled how to practice. I had my own band in 6th grade and a different one in 7th & 8th. In 9th grade, I started playing drums in a band. In high school, I made Jazz Band on Drums. It was competitive, but I got it. My dad had showed me some basic stuff he learned from Chuck Brown, some weird finger exercises. I was playing all the time, really geeking out about technique at first. I can’t really credit anything but spending hours on it! What were the bands like that you started outside of school? The first band was called “Kiss My Brass”. It was weird, jazzy stuff, based off of the format that we learned from school Jazz Band. In 8th grade, I started veering off. I got a distortion pedal to play my saxophone through and wrote these really fast metal songs and the bass played through a Moog synthesizer. In high school, my bands were “Oh Lucky Man” then “Rural”. Wow, so you were pretty serious about sax! Do you still play? As soon as I switched to drums, my dad sold it and I haven’t had one since! Honestly, I dream about playing the saxophone. This past week I had 2 dreams about playing! I kind of want to buy one again. After you graduated school, how did you continue with music? When I was 18, I started playing with an abstract Jazz group with Luke Westbrook and Matt Montgomery. Donald Fahley (of the jazz legend Jimmy Smith) was their drummer, and I was his drum tech since he was super old I would set up his drums and then sit in if he was too tired to play. I played with them for a few years, at least weekly in San Francisco. It was super out-there, free jazz. After that, I took an opportunity to move to Napa and live for free on a vineyard, owned by a bassist that I played with. I just practiced all day! After about a year, I moved to San Francisco. I was working night shifts and practicing Indian classical music all the time. How did you get introduced to Indian Classical Music? In high school, I had done some studying and drumming with Edgardo Cambon. He was teaching me bata and Uruguayan drumming. 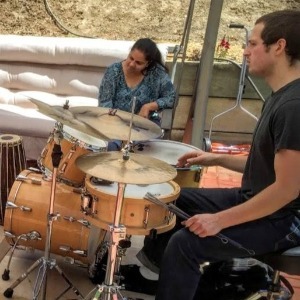 We played in a troupe, and one of the other guys in there said, “If you’re into different rhythms, you gotta check out this tabla stuff. It’s the craziest in the world!” Once I checked it out, I just got more and more recordings, then books and DVDs, then finally got a konnakkol teacher and started learning with Somashekar Jois. For someone that might not know what this is, how would you describe Konnakkol? A lot of people like to compare it to beat-boxing. It’s just rhythmic recitation. You’re reciting rhythms, that’s what it is. The best way to understand is to just listen to recordings. I still practice it every day and I use it for writing, but I haven’t been in lessons for the past year and a half. What are you involved with now? Are you still practicing, writing and performing music? Every single day I wake up and do a Yoga, breathing thing. I exercise a tiny bit, usually play for a few hours, then go about my day. I’ll also play a little bit when I get home from work. Currently, I’m playing with an experimental rock/funk band and another band called Curling. It’s a noise pop thing, like My Bloody Valentine. We’re working on an album. There’s also a noise duo that I started with a bass player. I’m getting back together with Luke Westbrook. I write a ton! 90% of it, I don’t do anything with. I work on parts for bands I’m in, or I’ll just mess around with ideas for hypothetical situations. Sometimes I’ll write on drums, sometimes on piano. I use Abelton. Very rarely I’ll play guitar, but my chops are incredibly limited. How would you describe the music you’re currently making? It seems like you fall on the more chaotic end of the spectrum. You could call me a chaotic musician for sure! I’ve always been into that. I look at it as just making art. I like making recordings, and combining improvisation with composition. And there you have it – a little bit of backstory on Kevin. We look forward to having him on staff!